On the Modules tab, you can view and modify the settings specific for WAPT Pro modules. WAPT Pro uses Java to make conversion of GWT data to XML. Here you can specify a path to java.exe file. The version of installed Java should be the same or higher than the one used on the server you are testing. The option Automatically create variables for ASP.NET values allows creating variables for ASP.net-specific values during recording. The option Automatically create variables for values inside JSON message allows creating variables for dynamic values inside JSON messages during recording. The option Automatically create variables for AMF message IDs allows creating variables for AMF message IDs during recording. 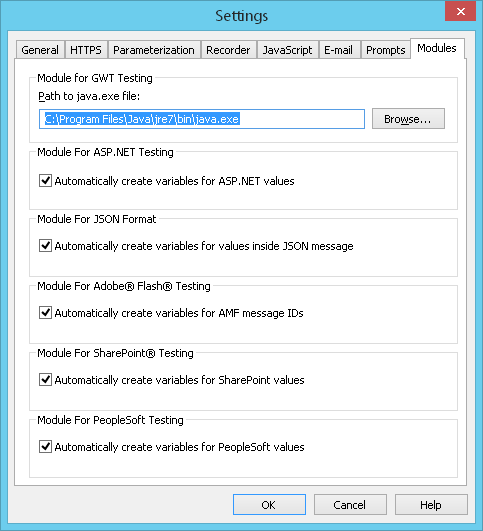 The option Automatically create variables for SharePoint values allows creating variables for the SharePoint "request digest" tokens during recording. The option Automatically create variables for PeopleSoft values allows creating variables for the PeopleSoft specific cookie values in request headers during recording.